Not Sure Which Delicious Treat to Get? Want coupons and deals sent directly to you? 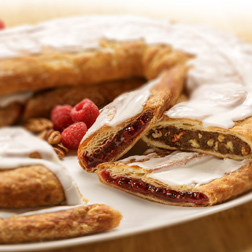 Each Kringle is 22 oz. Inspired by those delicious chocolate turtle candies! 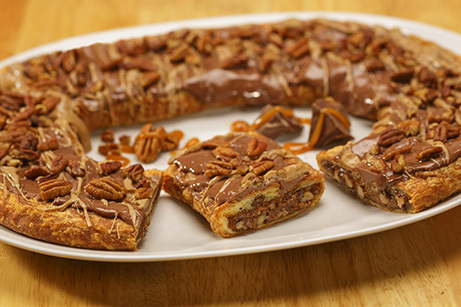 This Kringle is filled with the perfect amount of buttery caramel and pecans with a rich chocolate icing and sprinkled with chopped pecans. Contains egg, milk, soy, wheat, pecans. May contain traces of tree nuts (almonds, macadamia nuts, walnuts, coconut) and peanuts. Wheat Flour, Margarine (Interesterified Soybean Oil, Water, Salt, Mono- and Diglycerides, Colored with Annatto/Turmeric. Calcium Disodium EDTA preservative. Artificial Butter Flavor. Vitamin A Palmitate added. ), Pecans, Brown Sugar(Sugar, Molasses, Cane Syrups), Sugar, Eggs, Corn Syrup, High Fructose Corn Syrup, 2% or Less of the Following: Butter (Cream, Salt), Cocoa Powder, Dextrose, Soy Protein, Soy Lecithin, Yeast, Palm Oil, Modified Food Starch, Nonfat Dry Milk, Calcium Carbonate, Maltodextrin, Natural & Artificial Flavors, Red 40, Blue 1, Yellow 5, Cinnamon, Calcium Propionate Preservative, Tocopherols Preservative, Agar-Agar, Potassium Sorbate Preservative, Sodium Propionate Preservative, Malted Barley Flour, Corn Starch, Guar Gums, Vanilla Bean Extractives, Color Added. 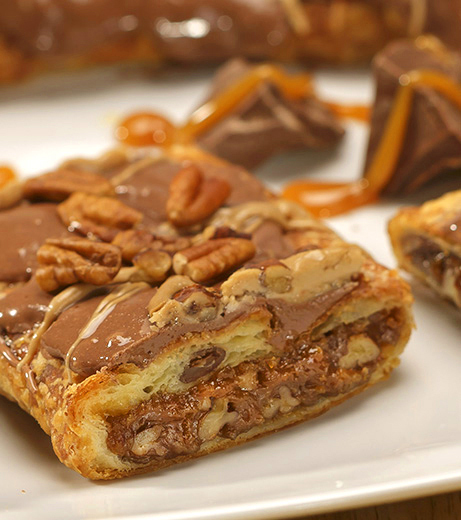 Whether you need your order shipped standard delivery, next day, or scheduled for future delivery, rest assured that your Kringle will arrive carefully packaged to ensure their arrival, safe and sound. When placing your order, your vital information is encrypted using SSL (Secure Socket Layer) to safeguard against being stolen or intercepted while being transferred to us. Like Us for a Chance to Win! Get Deals in Your Email! If for any reason you, or your gift recipients are not completely satisfied with any of our products, please let us know. We will make every effort to make things right. We welcome the opportunity to make you happy.